Summer 2015: The restaurant is closed due to renovation work. Erdinger Weißbiergarten is located in the Großhadern district of Munich. The history of the main building dates back to 1539 when it was part of a farm. In 1804 the house was converted into a restaurant. 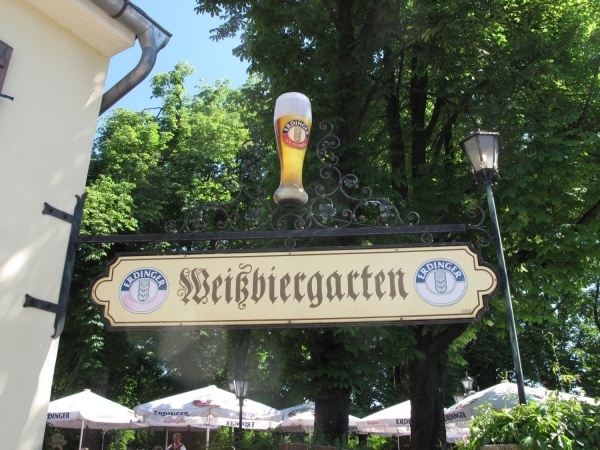 In 1995 after a year of restoration the first Weißbiergarten of Munich opened its gate to guests. Today the building is listed with a historical protective status. The small beer garden has 250 seats shaded by large chestnut trees. The self service area and the serviced area are divided by a small wooden garden fence. The food stalls in the self serviced area are not always open. At such times guests seated at the non-serviced tables can still order their beer (and food) via the waitress in the serviced area for the same price as normally charged at the food stalls in the self-serviced area. The Erdinger Weißbiergarten is open daily from 5pm until 11pm and on weekends from 4pm. The Erdinger Weißbier selection include the standard, dark, light and old Bavarian style “Urweisse” variety. A litre Weißbier in a normal Maßkrug costs €7.10 (April 2013). There is also beer from Augustiner and Fischer's available.